The article’s subject is lexicographical parametrization, the concept developed and introduced for scientific use by Yu. N. Karaulov, and the way it has been implemented in the Modern Explanatory Dictionary of the Live Russian Language, which is being developed by the Computer Lexicography Lab at St. Petersburg State University under the general guidance of the author of this article. The article provides an original classification of lexicographical parameters and shows how lexicographical parametrization can be used as a tool for defining typological characteristics of any given dictionary in the theory of lexicography and how it can help unify dictionary developments in lexicographical practice. Keywords: theory of lexicography; lexicographical parameter; dictionary entry; dictionary unification. The analytical review describes little-known events of 1940–1950s, related to the preparation and publication by S. I. Ozhegov of the first regulatory single-volume “Dictionary of the Russian Language”. The author introduces new archival materials, revealing some rare facts from this dictionary’s history. The paper presents and analyzes the editorial debate, research teams’ discussion of the manuscript, its feedback from the readers. The history of “The Dictionary”, published and commented in the paper, shows the complexity and inconsistency of the interpretation of individual words from ideological point of view, and describes the lexicographic “battles” often occurred because of it. 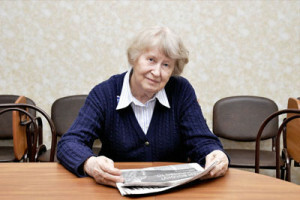 The article is concluded by the publication of a symptomatic review of the “The Dictionary”, printed in the capital party newspaper “Culture and Life” on the eve of the famous “debate on the language”, and S. I. Ozhegov’s answer, motivating his attitude towards the problem. Keywords: language personality; dictionary; lexicology; lexicography; science and ideology; history of linguistics. The authors address the problem of interjections’ lexicographic description from the point of view of their semantics and functioning in speech, and present the results of the experiment of describing the interjections by method of seme analysis. Keywords: method of seme analysis; experiment; metalanguage for the description of interjections. The paper deals with the expression of modal meanings with a combination of perfective and imperfective infinitives plus the predicative adverb “nel’zja” and the negative particle “ne”. The author propounds interchangeability of the words “nel’zja” and “ne” in combination with an infinitive to express action impossibility or prohibition. The result of the study suggests that the replacement is possible only in the sentences with a non-verbalized and potentially generalized subject. Keywords: verbal aspect; infinitive; modal meanings; prohibition; impossibility. The article discusses implementation of the content aspect of incentive modality in the discourse of public service advertising. Imperative situation is mediated by the discourse features of public service advertising, which have an impact on the choice of directive speech acts and the frequency of their use. The directives that convey non-categorical incentive are more frequent in the discourse of public service advertising. The prescriptives are also used, but their functioning is possible only in a limited number of subject areas. Keywords: public service advertising; discourse; incentive modality, speech act incentive. The article is based on the material of Russian rhetorical treatises of the mid-18th century, and deals with the interaction of rhetorical theory, and the history of literary language of a new type in the period of its norms’ shaping. The author places special emphasis on poetical illustrations in rhetorical treatises, which give an interesting material for reconstruction of that epoch’s linguistic consciousness. Keywords: history of Russian literary language; rhetoric; rhetorical treatise; illustrative examples; linguistic consciousness; Mikhail Lomonosov; Aleksandre Sumarokov; Antioch Kantemir; Vasiliy Tredjakovky. The author suggests a model of the rhetorical text, including macro strategic (cognitive) and strategic (text) levels of its production. The first level is associated with the speech subject, actualizing a communicative image of the text type, that is a complex of ideas about the properties of the text given by the communicative situation. The second level provides a system of text-formation strategies which are correlated with the stages of the rhetorical canon as a procedure of text creation, and determine the typological features of the rhetorical text. Keywords: rhetorical text; levels of text modeling; communicative image of the text type; rhetorical canon; psycholinguistic models of speech production; strategies of text-formation; typological features of the text. The author analyzes the methods of content organization of TV-text under condition of using written text elements, such as scrolling text, subtitles, and pull-quotes, and examines the systemic speech failures. Keywords: oral speech; written speech; irreversibility; subtitles; access channel. The article addresses the example of promotional discourse on TV in order to study the problem of desacralization of contemporary linguistic consciousness of Russian cultural linguistics community. The author describes the concepts pertaining the sacred status, illustrates the use of precedent phenomena of Biblical origin in promo videos language; analyses the reasons of communicative failures; describes the consequences of ethnolinguistic norms breaking. The author comes to the conclusion that the use of transformed quotes from the Scriptures by the journalists, their ironic play with events and names taken from the Holy Tradition, names of sacraments, rites, and objects of worship in a language game for comic effect is detrimental for speaker’s communicative endeavors, since it makes the promo text less pragmatic. Impertinent travesty of death images, intense exploitation of obscene precedent phenomena is perceived by the addressee as a blasphemy. As a result, a promo video as a part of televised promo discourse does not accomplish its dual implicit intention of informing and advertising the TV audience in order to draw and keep their attention, thus missing its stylistic point. Keywords: TV promo discourse genres; TV announcement; promo text; desacralization of linguistic consciousness. The paper focuses on a cross-cultural analysis of an impact of the first Soviet Sputnik launch in 1957 on the spread of the Russian language teaching in the USA in high schools, colleges and universities during the Cold War. The paper analyzes provisions of the National Defense Education Act and its impact on Russian language teaching, creation of television courses on technical Russian, the explosive growth of Russian language enrollments in American high schools and colleges, as well as the growth of Russian studies graduate programs in American universities in late 1950s and early 1960s. The article deals with specific challenges and opportunities for Russian language teaching in the US, which emerged in the post-Sputnik period. Keywords: Russian language teaching in the USA; post-Sputnik period; cross-cultural analysis; changes in curriculum. The article is devoted to the events connected with the publication of the novel “Doctor Zhivago” by Boris Pasternak, the Nobel Prize award, and the reaction to it of various persons and public institutions. Keywords: Boris Pasternak; “Doctor Zhivago”; The Nobel Prize; ideological campaign. The author analyzes the content and structure of the goodbye letter written by Antonina Aleksandrovna to Yuri Zhivago, its characteristic language features, helping to understand the possible reasons of her saying goodbye to her husband, the correlation of letter’s composition parts to the events and characters of the novel. Keywords: Boris Pasternak; composition and language characteristics of a letter; literary context. The article focuses on some linguistic and methodical problems regarding selection of lexico-semantic variants of the prepositions, included in A1 level (common language) teaching content, as well as on some matters referring to presentation of prepositions in the main standard methodical documents of that level. Keywords: Russian as a foreign language tests; level A1; common language; basic dictionary; state standard; preposition. The article characterizes the content of competence and educational paradigm of the process of training a qualified foreign specialist in the course of Russian as a foreign language. In this regard the article describes the study course elaborated for students of non-philological universities, built on the basis of modern integrative research in the humanities and aimed at making a creative multicultural personality of the student in the process of his professional training. Keywords: integrative strategy; professional, communicative and linguocultural competence; a system of concepts; personal linguocultural sense; structural universality of the complex; effective vocational and intercultural interaction. The article presents the history and modern life of Polish (Mazurian) Old Believers, the descendants of people resettled to East Prussia in 1830, who had found themselves in 1945 within the Polish borders. 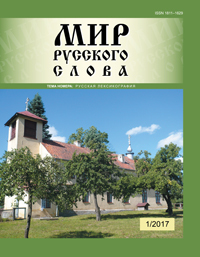 The Old Believers’ culture has been described by German scholars, but now the most active research in the field of cultural heritage, primarily in its written form, is conducted by the scholars from the University of Warmia and Mazury in Olsztyn. Keywords: Old Believers in Poland; the written form; cultural heritage.